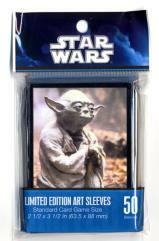 Use the Force to protect your cards! Fantasy Flight Supply presents Star Wars Art Sleeves in six thematic designs, offering players new ways to shield their valuable cards as they simultaneously evoke dramatic space battles, dashing rogues, heroic mentors, and menacing villains. These attractive, high-quality sleeves come in packs of 50 and are made of 100 micron-thick, non-PVC, acid-free polypropylene plastic. This means that the sleeves are durable and free of damaging chemicals that could corrode your cards.